This post contains affiliate links for your convenience. All opinions are my own. Brrr, its cold in our Arctic small world today! 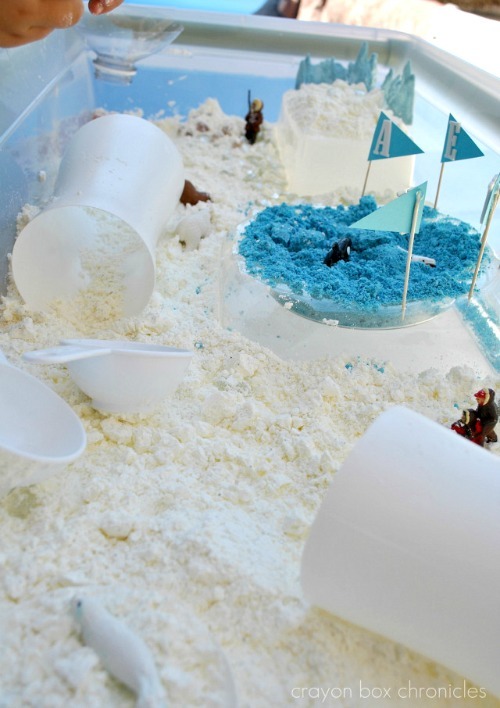 Let’s venture up to The Arctic Circle at the North Pole and explore creative messy play with homemade snow dough and a vowel lesson! 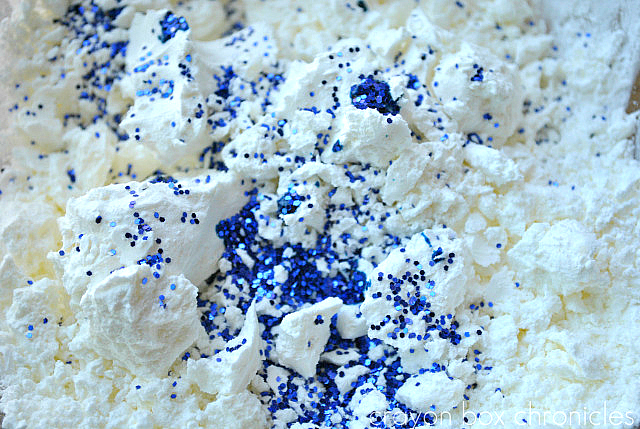 Snow dough is so fun— it molds, crumbles, and sparkles. 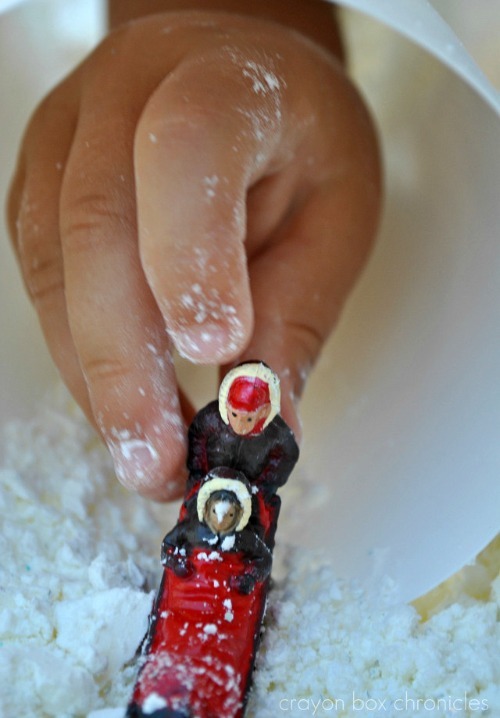 After spotting this fun snow dough recipe at The Imagination Tree, I was ready to dig in! I’m trying to use homemade doughs for all our small worlds now, so this was just perfect! Pop over to get her awesome recipe! Our arctic animals include a polar bear, arctic rabbit, arctic fox, huskies, caribou, harp seal, beluga whale, walrus, Eskimo and musher. Today’s small world engages sensory muscles, imagination, and teaches your child about science, geography, animals, and vowel recognition and sounds. Let’s dive right into the snowy fun! Here’s the breakdown — large container, recycled plastic containers, marbles , snow dough recipe, paper, sticky letters, toothpicks, blue tempura paint, and Arctic Toob Animals. Total cost = $7. We had all the supplies, except the cornstarch and baby oil for the snow dough. We used all our corn starch last week when we made our scented play clay. Here’s a look at the pre-arctic landscape made from Happy Baby Organic Puffs containers, wipes box, and Costco Organic Animal Cracker Tub, and the top of a juice bottle with the cap (not pictured here). This small world is very simple to set up provided you collect containers, lol! So fluffy and sparkly! It almost looks edible — it’s NOT EDIBLE, even without the glitter. After making 3 batches of the snow dough, we needed to tint one blue for the ocean. I thought I could use food coloring, but sadly I was mistaken. Apparently powdered tempura paint works best, but seeing as how I didn’t have any, I tried an experiment — regular tempera paint — it worked! Now, if you’re planning ahead, powder paint uses less and doesn’t dry out as fast, but I’m happy with the coloring. 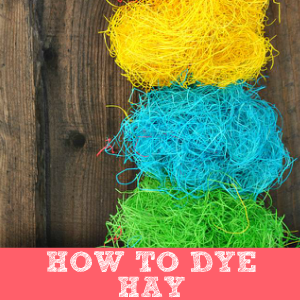 Just keep adding a little at a time, then really mix well to meet desired coloring. I noticed that the back of a spoon works well, mushing it down, then swirling it around. So pretty right? Now, let’s get messy and explore The Arctic Circle in the North Pole. Watch out for those icy snow marble balls, the super-slick snow tunnel, floating ice caps, blue dough ocean, and vowel flags! A, E, I, O, U and sometime Y — its vowel learning time! Orca and whale are swimming in the big blue dough ocean! 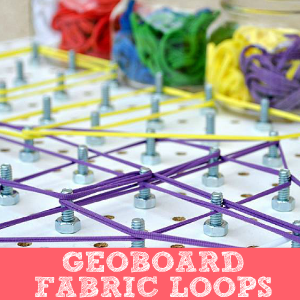 The flags are really simple to make — cut out blue flags, adhere foam letters, and hot glue to a tooth pick. Next, I pierced them through the plastic with my Brad Piercing Tool — prefect fit! I love this tool! Surprisingly, I use for a lot of projects. Mr. Eskimo treks through the think and icy snow to find shelter. Harper seal is riding the ice caps! Watch out for Orca, he’s a predator! Caribou is taking a rest on the top of the ice! The snow sparkles so bright! The arctic Rabbit is sure having fun — snow ball wrestling match! I think the snow is winning?? The snow fox is exploring the tunnel in the Arctic Circle. Look out below animals, it’s a swirling, whirling, snow-ball funnel! With all the shifting ice in the Arctic, be careful and watch out for falling snow marble balls! 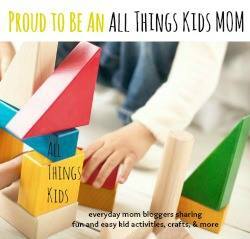 C loves to put things inside of things, down things, through things — you name it! This is a 64 oz. juice container cut off at the top. 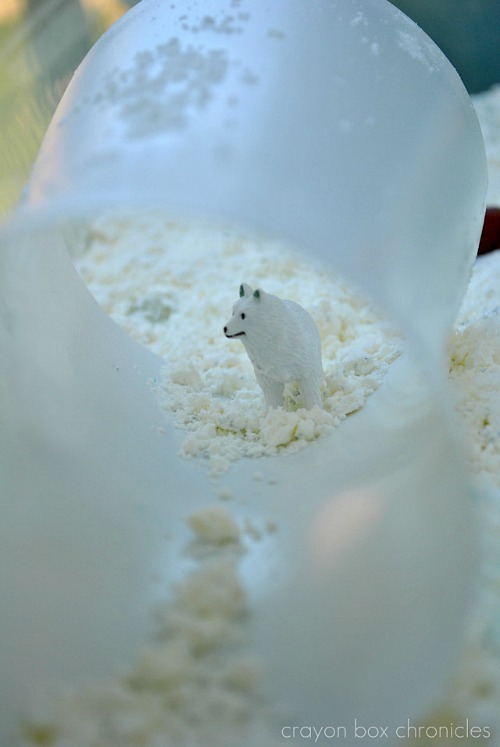 Here is a closer look inside the whirling, twirling snow-ball funnel! Rabbit and Polar Bear are exploring together! Watch out for that shifting ice, it’s getting warmer in the Arctic Circle. Walrus!!! Look at those teeth — so big! Weeee … through the tunnel we go! We added some measuring cups for extra fun! C began smashing all the snow balls. He kept singing the vowel song all day too! 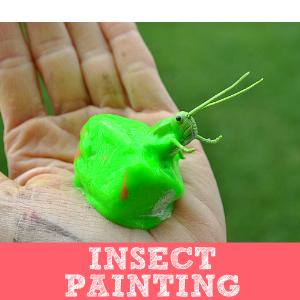 What a great sensory experience — messy and fun! 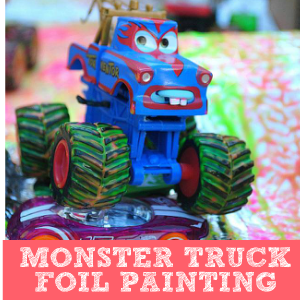 I’d recommend doing this outside if possible — it can get messy, but it’s definitely worth it! 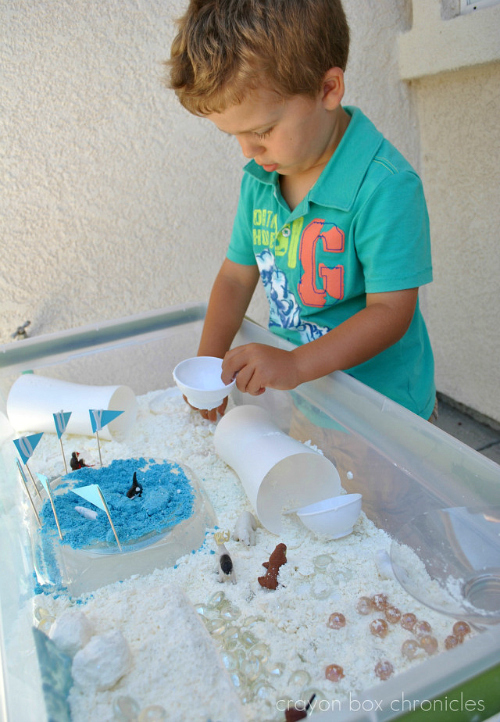 For more sensory bin play, check out Mini-Beach Sand Dough Bin and Rainforest Sensory Bin. 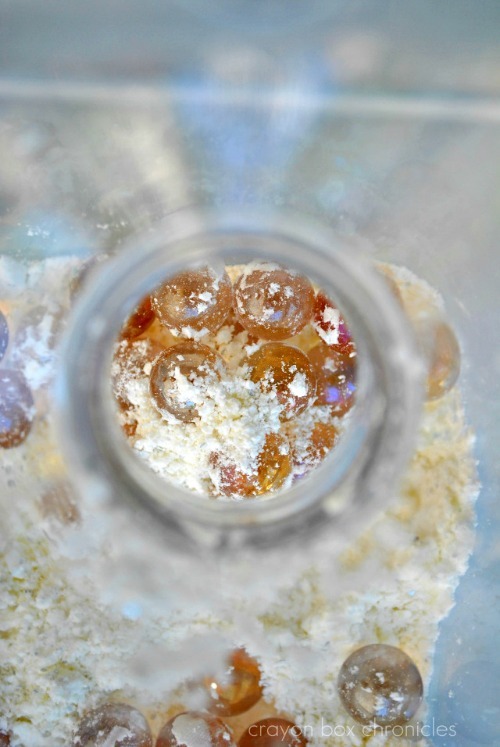 To store snow dough: Simply seal it an air-tight zip lock bag in a cool, dry place. Ours last about 6 mounth, but double-check the bag periodically. 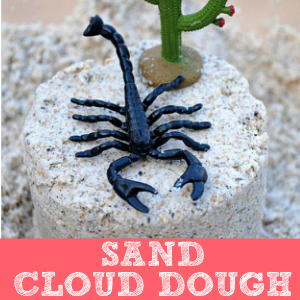 We re-use of dough for other projects. Another fun option is adding colors! This is so inviting and just wonderful! Wow that is as gorgeous as it is fun-looking! Thanks for sharing, great photos too! I just love this artwork. I am a marine conservationist in the Philippines working on dolphins and whales. I just find this truly amazing! Hi loveorchestrated! Thank you! Wow, that’s amazing! You have such a fascinating carer. My son’s world is sea life. I truly believe one day he will be a marine biologist or something relating to the ocean and animals! Thanks again. 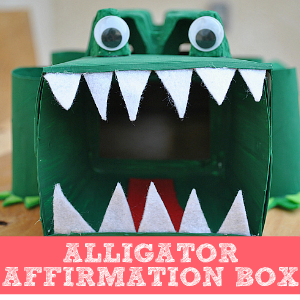 This is such a cute sensory bin – I LOVE the theme! I featured this on TGIF this week! 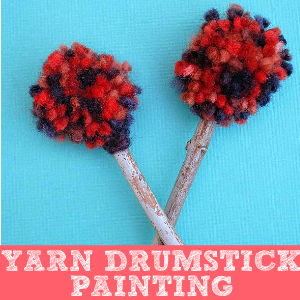 Thanks for linking up and sharing your creativity with the rest of us – hope to see you linked up again later today! 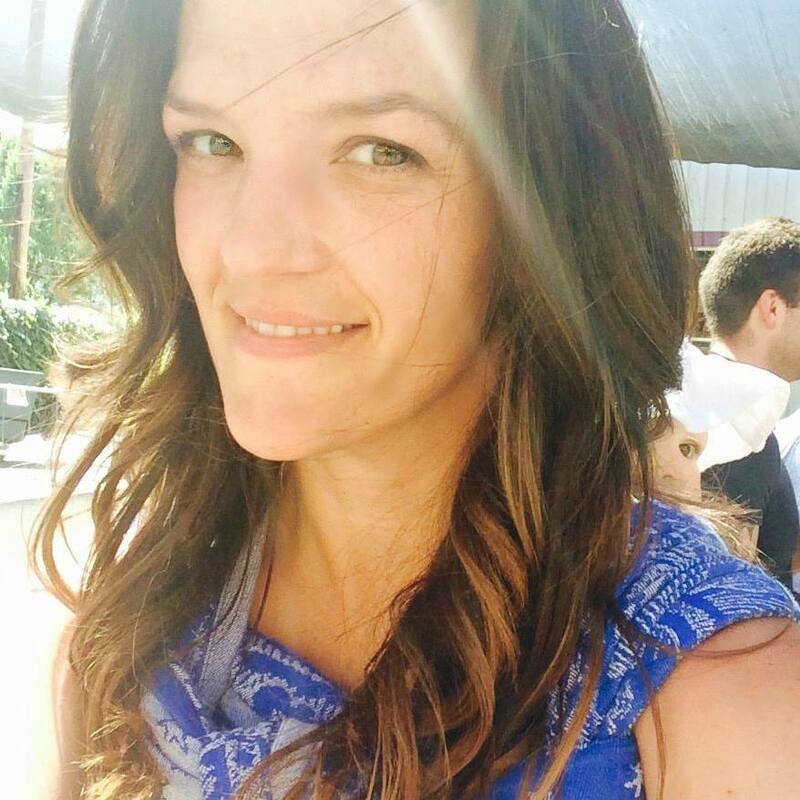 Hi Beth! Thank you so much! Messy play is so fun! I’m headed over there now! Enjoy your holiday weekend! 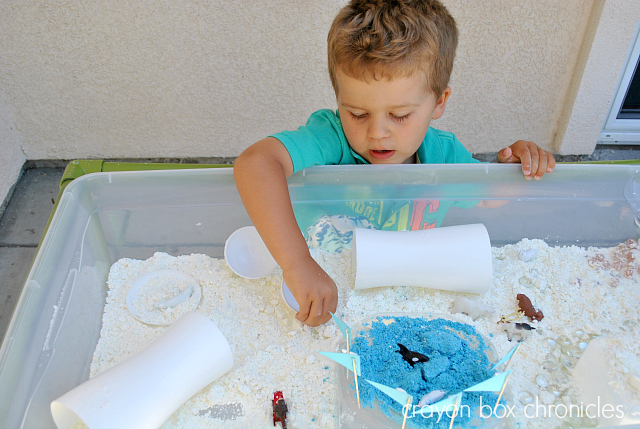 This sensory bin looks so inviting – I think I want to play in it too! 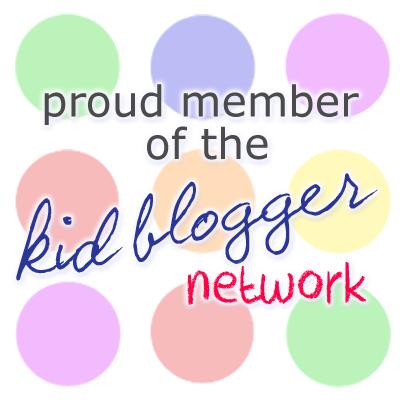 thank you pisforpreschooler. Me too! 😉 I couldn’t get over how soft is was and it smelled so good! Your sensory bins are SO detailed. I love the combination of materials here! Thank you Shaunna. C likes to make “a big giant mess” as he calls it! 😉 This one was definitely messy, but so fun! Thanks again.